In a move that’s sure to bring a smile to the face of many customers, ING Direct is now offering paper checks to go along with their formerly-paperless “Electric Orange” checking account. According to reports, they’ve been notifying customers of this feature, though I haven’t yet received notification. After my Electric Orange checking is opened, will I receive paper checks to write? 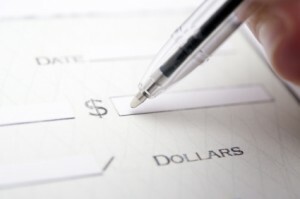 You won’t automatically receive checks to write, but you can order a checkbook of 50 checks for $5.00. If you prefer to pay electronically, you’ll still be able to make payments online or use your debit card for purchases. Apparently these checks will include additional security features like extra digits that ensure only “valid” checks will be processed. I’m guessing that this means you’ll have no choice but to buy your check from ING as opposed to buying checks online. While many of you may scoff at the need for paper checks, we still use them for all sorts of things. Sure, you can use online billpay to send a paper check to a payee that doesn’t accept electronic payments, but that doesn’t work very well for school fundraisers, sports registrations, etc. For us, the lack of an online checking account with actual checks meant that we couldn’t completely ditch our local bank. Sure, we could keep most of our savings online to take advantage of the higher interest rates, but we still needed a “real” checking account. Depositing checks is about to get a whole lot easier. Hang tight … we’re just dotting the i’s and crossing the t’s. In the meantime, continue depositing checks the same ol’ way. The same ol’ way refers to either depositing the check in a local bank and then transferring the funds electronically, or depositing checks by mail (click link for details). The first option is what I’ve always used, but it requires a local bank. The second way is workable, but slow. Once they get the whole remote deposit thing figured out, we’ll have little use for a local bank, and may end up transitioning to an entirely online banking process. Until then, however, we’ll maintain the status quo. What about you? I wish I could deposit by mail with my (local) bank. I don’t care how slow it is, since it would still be faster than sticking it in our mail pile and forgetting about it for a few weeks, and take less of my time than driving to the bank. Obviously online deposit would be even better, but since I don’t have a smart phone I guess that would require a scanner or something. so I doubt that will ever get implemented. Got my email and ordered my checks right away! ING on auto-pilot is a wonderful thing. Direct deposit goes in, regular auto-pay bills go out, the difference gets swept into ING Savings each month….”egg money” as my mother-in-law would call it. I maintain a local credit union acct for the day-to-day stuff — gas, groceries, fun, etc. I like 2 accounts. It keeps funds from being co-mingled. I always know the serious, grown-up bills are getting paid….while the wife can use the local acct for family and kid needs week to week. I suppose a 2nd acct with any fee-free bank would do, but I like ING’s website and overall “feel”. Being internet based, it is enough “at arms length” to encourage saving for my family. finished my 15th debit transaction today to qualify my local bank’s “Reward Checking” for this month. If you have such a thing locally these are great. I get 3% interest rate, reimbursed ATM fees, and no fees so long as I meet a few requirements. I have to have at least one ACH transfer, 15 debit transactions, and use their online statement feature each month. I don’t get any free checks or a paper statement, I just get the great interest rate. One downside is that this is a single-branch local bank and they are not part of a wider no-fee ATM network, but they do reimburse fees for using other ATMs. Getting around the 6 transaction/month limit on savings accounts. My paycheck is direct-deposited into our ING checking every other Friday, and the following Monday it gets portioned out to 7 sub-savings accounts and up to three automatic investments. Add in an occasional transfer to our brick-and-mortar bank and two monthly mailed checks, and we could have 30+ transactions per month. Brian: Online banks typically offer higher interest rates. Gone are the days of 5% or more interest rates, but 1% is still a lot better than the 0.1% or less that you can get at many local banks. If you can do as well or better with a local bank, then there’s not much reason to bank online. Please forgive my ignorance, but what is it about ING that makes it (somewhat) more attractive than a local bank or credit union? I’ve kept my local bank for the need to have free ATM access. ING has very few fee free ATMs in my area and I’m just not willing to pay. If they start reimbursing us for ATM fees then I’d probably drop my local bank. I had switched to ING’s checking, but had to switch back to a regular bank when I realized I couldn’t renew my passport because I couldn’t send a check. Also, you don’t need a real brick and mortar bank to maintain an ING checking account. It would be awesome if they would do the smartphone app photograph check to deposit it. I don’t know how many banks are doing that yet, but Chase is and I LOVE it. It’s the only thing that’s keeping my account open at Chase. It is the need to have a real brick-and-mortar bank to maintain an ING Checking Account, is the reason why I have yet to open an ING Checking Account. I had no idea that you couldn’t actually write checks out of those accounts….what is the value in having an ING Checking Account?